An unexpected experience with a touch of style, grace, and imagination the Guest remembers with fondness and a smile. Creating an unexpected, unpredictable, and valuable experience that is both memorable and reproducible. Today’s Guests are often surrounded by lackluster, mediocre service in every industry. How can you win their attention, admiration, and loyalty? By using the magic of amazement, delight, and enchantment to create a Guest experience that soars far beyond their highest expectations. Customer Service wizards Ron Zemke and Chip Bell share their powerful bag of tricks in their book Service Magic. Subtitled “The Art of Amazing Your Customers,” it delivers a powerful bag of tricks to help you add zest, memorability, and value to your customers’ experience in ways they would never expect. For leaders in ChurchWorld, the translation from customer experience to Guest Experience is an important one – starting with your mindset. You may not think you have “customers” in the traditional mindset – and you don’t. But you do have Guests coming to your church (hopefully!) and they, like you, live in consumer-driven world. Why not study and learn from some of the best minds and practitioners from the customer experience world, and translate them into Guest Experience practices for your church? Take Service Magic, for instance. There is a feeling of awe, wonder, pleasure and delight in Service Magic. When it is present, the customer perceives that something special and unique has been done to, for, or with him or her. It can come from a word spoken, an experience observed, a process experienced, or the context in which the service occurred. 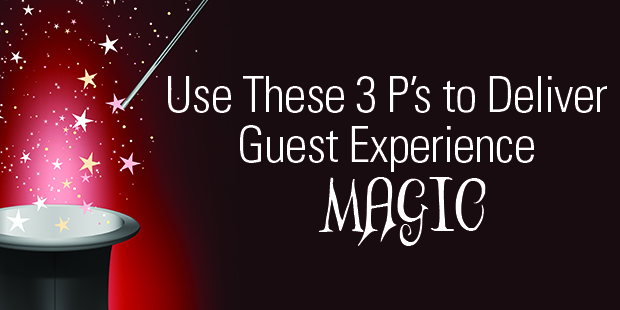 There is magic in Place, Process, and Performance – and all three are available to the skilled service magician and the organization determined to create consistent Service Magic for its Guests. Place Magic: a venue – natural or manmade – with physical attributes that attracts and pleases, and that are subtly enhanced by human endeavor. We vacation at national parks to enjoy the great out-of-doors and visit theme parks for fun and thrills. We remember most of the great views and the rides, but without a little Service Magic, those pleasures would be greatly diminished. You meet in a facility – owned or rented – that conveys a powerful impression to your Guests. What does your facility “say”? What are you doing on a regular basis to evaluate your place? What plan do you follow to make sure your place is the best it can be? Does your place invite people to come in – or does it turn people off, or even away? Do you have a plan of constant evaluation and upkeep? How “fresh” are your interiors and exteriors? Does your place fit into your community or does it stand out? Process Magic: the often thankless, almost always invisible effort that makes the difference between policies, procedures, and routines that are difficult, confusing, maddening, and frustrating – and those we experience as surprisingly easy, positive, and memorable. No waiting where once lines were long; sign-ins, sign-ups, and renewals that are hassle-free and even interesting – if not fun – are the result of a little well placed Process Magic. Your Guests should experience an invisible, seamless flow of actions from their first contact with you all the way through a worship experience and back again. The processes behind that invisible, seamless flow are probably complicated and maybe even confusing. What are you doing to regularly evaluate and change the process behind the curtains? Do you know what Guests experience when they come to your church? Are you using and speaking with a “churchy” language or do you make things simple to understand and follow? Performance Magic: the surprisingly positive interaction with someone from an organization during the acquisition of a service or a product – or even when a problem with a product or service is being resolved. The wait staff who makes the dining experience “work” for you by correctly reading your mood and engaging you in light-hearted banter or by leaving you alone to your solitude are card-carrying, practicing, professional service magicians. When it comes down to it, your front-line teams: parking, greeters, ushers, etc. – make the first and most powerful impact on your Guests. Their actions often dictate whether or not a Guest will return – even before, and often no matter what, the worship experience. When was the last time you ventured out to the front lines to observe? How often do your teams receive training – and encouragement? How high are the expectations for your front-line teams? Each of these three “magics” is powered by a set of principles – which you can learn more about here. Want to learn how to Place, Process, and Performance work together to create an EXCEPTIONAL Guest Experience at your church? 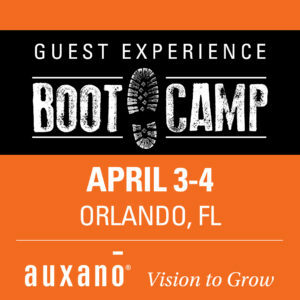 Check out Auxano’s Guest Experience Boot Camp, Orlando, FL on April 3-4. > Read more from Bob. 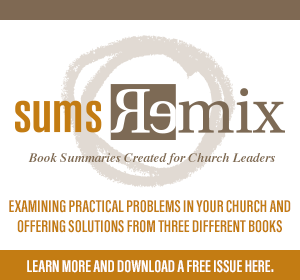 Want to know more about Guest Experiences in your church? Start a conversation with our team. We’re glad to offer our input. Your vision is at stake, so let’s talk. Bob is an absolute fanatic about Guest Experiences, growing up watching his father serve customers at the gas station he built and operated for 44 years. 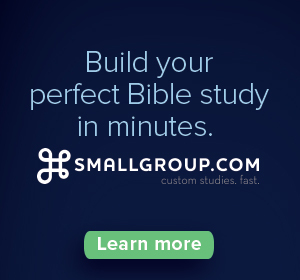 Bob is continually connecting with corporate leaders in the customer experience world, learning and then translating practices for ChurchWorld. He writes, speaks, and consults on the topic frequently. Vocationally, Bob has a dual role at Auxano, a clarity first consulting firm serving the church. As Vision Room Curator and Digital Engagement Leader he researches, edits, writes and publishes online content. As Guest Experience Navigator, he leverages his passion, providing Guest Perspective Evaluations and Guest Experience Blueprints. Bob and his wife Anita have been married for 39 years. They have 4 children, 3 daughters-in-law, 1 son-in-law, and 4 grandchildren.